You might know by now that I’m all about moist cakes. I can’t stand dry and flavorless cakes, which are two things this one does not have. The addition of pudding is basically the best thing ever. Every time I sneak another slice, I am dying just a little bit inside. I almost can’t handle the goodness. 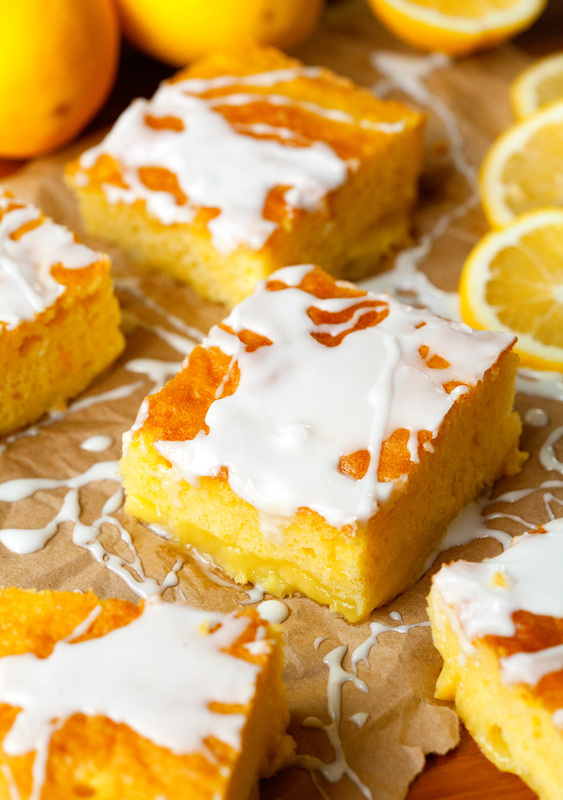 Your lineup of ingredients is simple: 1 box yellow cake mix (plus ingredients listed on the box), lemons, pudding mix, milk, water, granulated and confectioner’s sugar. 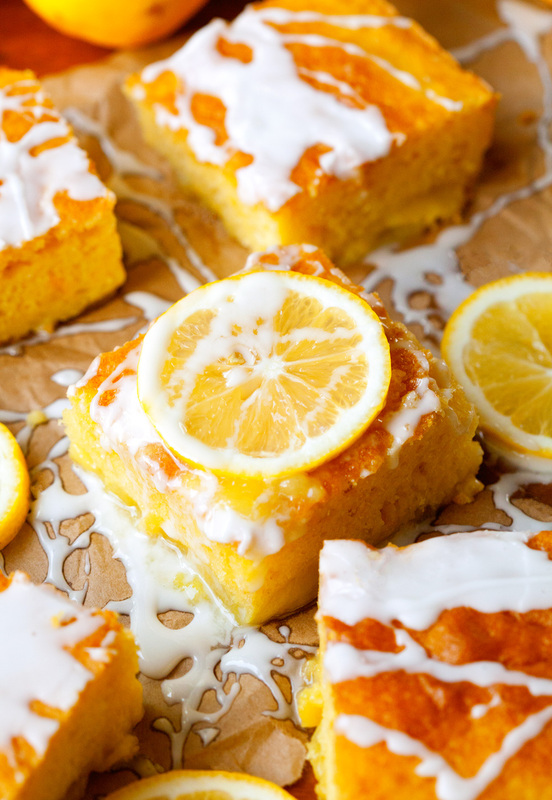 You’ll prepare the cake mix as instructed, add the juice of 1 lemon and its zest and pour the batter into the prepared pan. Next, you simply whisk together the pudding mix, milk, water and granulated sugar. Poured over the cake and that’s it. The oven will do the rest for you. 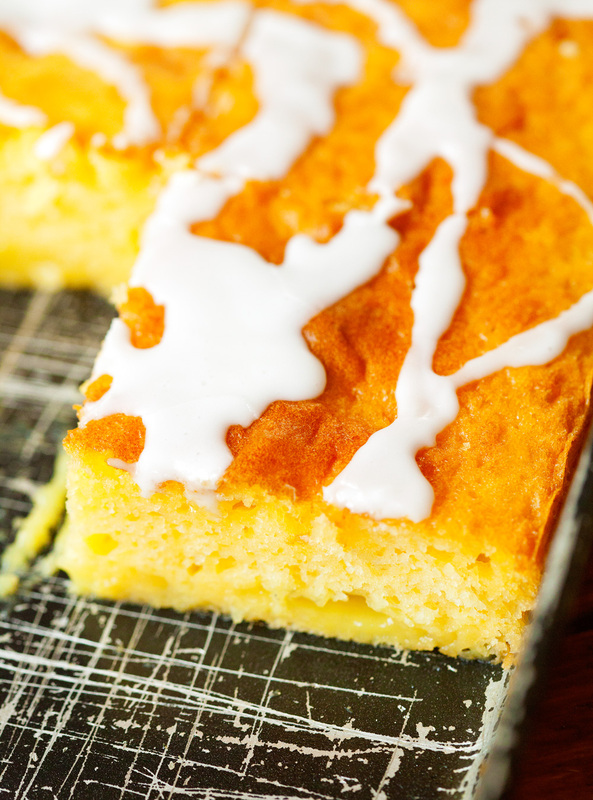 Once it’s finished baking, you prepare a simple glaze and drizzle it over the warm cake. 15 minutes later and you can dig in. This cake is just as delicious when it had a chance to cool, but it’s the very best while still warm. I am drooling just thinking about it! As you can see in the pictures, the pudding sinks to the bottom of the cake. When you first take it out of the oven, it looks like any other cake. This is the perfect surprise dessert. Once you cut into it and see the pudding oozing out, everyone will be beyond excited to devour their own piece. It’s always a big hit! I am totally and utterly in love! 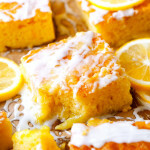 Lemon Pudding Cake is best enjoyed warm. Get ready to be wowed! 1. Preheat oven to 350 degrees F. Spray a 9-x-13 inch baking pan with nonstick spray. 2. In a medium bowl, prepare yellow cake mix as directed on the box. Add zest and juice of one lemon to the batter and stir to combine. Pour into the prepared baking pan. 3. In another bowl, whisk together lemon pudding, sugar, 1 cup milk, and water until smooth. Pour evenly over the cake. Place pan in the oven and bake for 40-45 minutes or until a toothpick inserted in the middle comes out clean. Remove from the oven and place on a wire rack. 4. 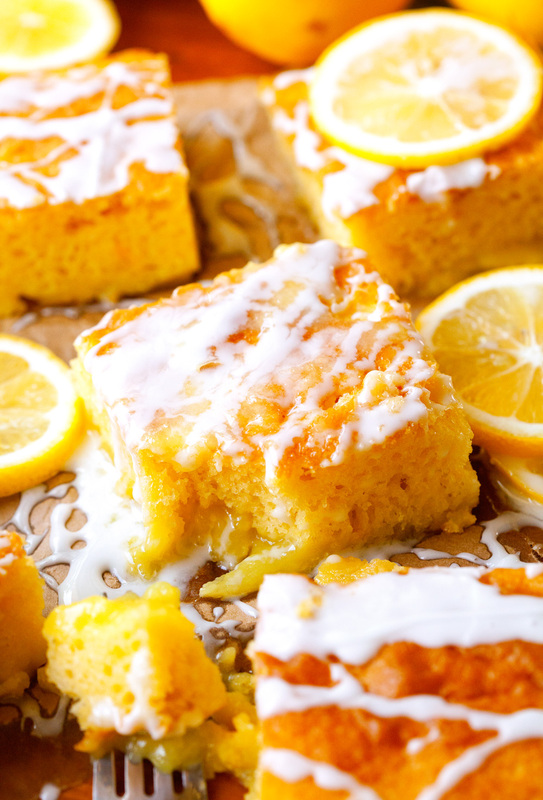 In a small bowl, whisk together confectioner's sugar, juice of half a lemon and 1-2 tablespoons of milk. 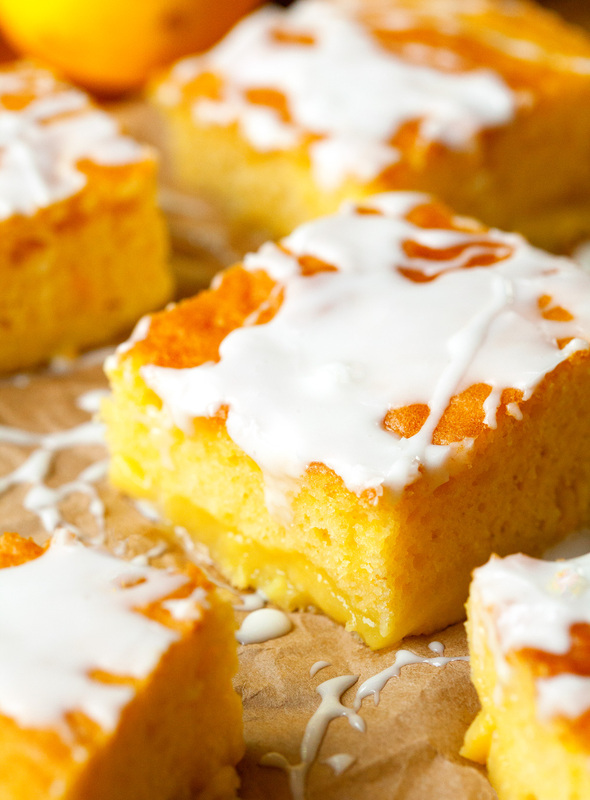 You should be able to easily drizzle the glaze over the cake with a fork, but it shouldn't be too runny. Add more confectioner's sugar to thicken (if needed). 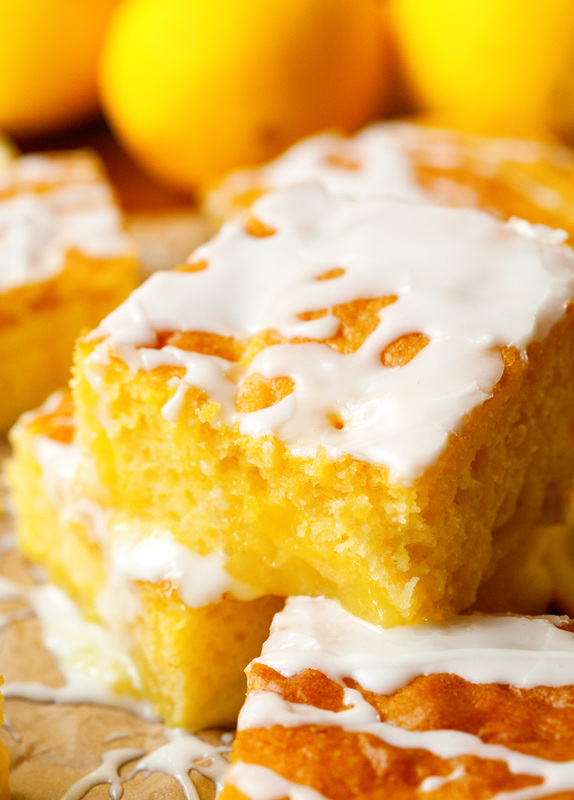 Once cake is drizzled, let sit for 15 minutes, then cut into slices, and enjoy! Dude Kathi this is legiiiiit. I love lemon anything!! Especially when it is this gorgeous. I am not really into lemon water (I just want to add sugar, lol) but when you describe how refreshing it is every morning it kind of makes me want it, haha.